There are a few chess players so intensely creative that I check out their games from time to time just to see what they've been up to. Among my favorite loose cannons I would suggest looking into Liviu-Dieter Nisipeanu, Alexey Shirov, and Ivan Cheparinov. No slaves to fashion are they. White kept a small edge and nevertheless won the game. White has three other choices after 4....Nc6, including 5. dxe5, 5. Nxe5, and d5. Amazingly, in all of these Black has good chances to equalize! was the start of Shirov v Timman (!) 1998, going straight to an endgame which Shirov duly won in classic style. But it is interesting that Timman was impressed enough by Murey's novelty that 5 years after seeing it from the White side of the board he was willing to try it for Black. 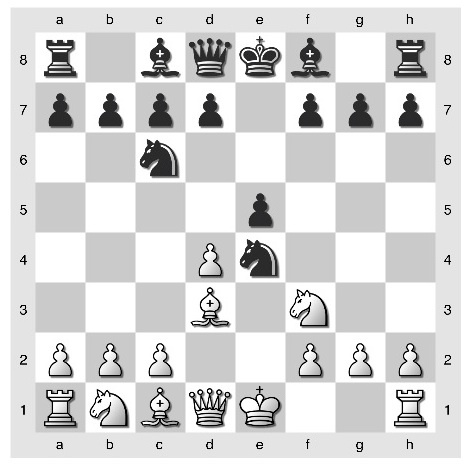 With a slight advantage for White though with limited attacking prospects; Raetsky and Chetverik suggest this as equal in their rather drab manual 'Petroff Defense'. That Murey could conceive of this move in a pre-computer era, independently evaluate all these plausible moves for White, and then play the move for the first time against a top class opponent rates him in the pantheon of the coolest customers on the board.